This component aspires to generate “cutting edge and integrated knowledge products” for addressing food, water, energy, and climate change issues for upstream and downstream basin populations. High resolution climate scenarios generated at basin, sub-basin, and catchment scales lead to better impact assessments. There is high uncertainty regarding the climate scenarios of Indus Basin. Efforts will be made to streamline and harmonize ground based monitoring system in the basin at a regional level, and thus will call for national cooperation on this form of data collection and management. The outputs will result in better knowledge and enhanced capacity of national and regional institutions to assess the impact of climate change and variability to implement appropriate adaptation options. Natural hazards are one of the key drivers of change. At sub-basin and catchments scales they can impact the livelihood of local communities, while at basin scale it can offset the economic growth. Climate change and socio-economic development is likely to increase basin vulnerability to natural hazards. The Indus Regional Flood Information System (RFIS) and Indus Basin Flood Outlook will be piloted to enhance the regional cooperation in flood management at sub-basin and basin levels. In both basins web-enabled operational national level strategic flood information system will be linked to district level Decision Support System for Risk and Response Planning and to locally driven proactive early warning and dissemination system. Climate change and socio-economic change in river basins is changing and increasing the pressures on water availability for all sectors. In the Indus basin, stakeholders will be able to make robust assessments of current and future water availability under different scenarios. This will allow for better anticipation of adaptation measures needed to sustain agricultural production and water for other uses. More generally, these activities will build awareness among upstream and downstream populations for understanding the potential impacts of climate change, and for develop adaptation measures that improve resilience. Springs source water to mountain communities, but the nature of springs remains poorly understood. In the HKH springs appear to be drying, or disappearing, only to reappear in other locations. Restoration of springs and recharge are two critical areas of work at ICIMOD. Our spring studies and practice documentation hopes to strengthen our understanding of springs, and to inform farmers to improve their management of these water sources. 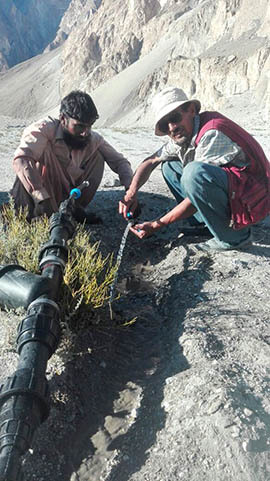 Pilot studies currently underway are expected to develop innovations for mountain farmers who rely on springs. In HKH countries, women are the primary stakeholders in water and sanitation, and as of late, an increasing role in agriculture. However, they continue to have a diminished role in decision-making and knowledge sharing on these issue. This is an unfortunate oversight as their frontline role in water issues can reveal the close inter-linkages between poverty, gender, and development. We are placing a strong emphasis on collecting gender-differentiated data on water to ensure that we develop programs and solutions that are distributed equitably. A comprehensive knowledge base on gender mainstreaming will enable improved policy advocacy for women.